Perfect & strong taste a very good tee for all the hours of the day. A perfect choice. the very long leaves look good, and the smell is very inviting. The tea is suited very well for more than one brew, and the taste will develop with each brew. It changes from slightly grassy to a more firm floral lingering taste. Very nice tea! I made it on the cool side, I will have to try with hotter water. A very grassy, nutty taste, but mellower than Long Jing varieties. This one seemed to have some good properties, made me very alert, but with a slightly nervouse energy too. Will brew more and report back. A very attractive looking tea, and the price is right. Thank you TeaSpring! A very fine tea. Good for digestion. The leaves are long and flat and a nice deep green appearance. Frankly I am disappointed. This is an expensive tea and aromatic too. However on brewing there is no taste or aroma. I feel like I wasted money on this one. Again, this is just an okay tea and nothing to get my taste buds aroused. It is more like an everyday type of green tea. Eccellente te´ dal sapore inconfondibile. È uno dei miei te preferiti! Quite light in taste so have to take pay attention to brewing process not to ruin it. A 3 from 1 to 5. Before ordering I was thinking about difference between this tea and Cha Wang. The taste of this is more grassy. And leafs are smaller. But TEA COLLOR IS EXTRA GREEN. Full of minerals. Excellent tea ! Very refreshing ! Nice and subtle. I have ordered this several times before, but this particular batch of tai ping you kui was the best that I have yet to receive. Hope it continues to be the same consistency each time I order it. Great all-around tea for everybody, anytime! Recommended! A great tea. I´ve drunk it everyday since I recieved it, and have enjoyed every sip! this was my first experience with this tea. And it was AWESOME! I love the floral notes that´s unusual for a green tea! A phenomenal tea with a great strong taste. I am definitely getting it again. Great tea, excellent quality form TeaSpring as always. The taste is a grassy-nutty (but more nutty to me) combination. Tea leafs look great. Recommended! A nice afternoon tea. Tea di grande delicatezza, decisamente dolce e rinfrescante, nessuna sensazione di astringente; le sue grandi foglie consentono di avere un infuso sempre limpidissimo ed un colore lucido. Clean and pleasant extremely subtle taste. Nice faint floral/grassy fragrance. The quality of the leaves is excellent. If there are any obvious flavor notes, it would be slight vegetal ones. If you do not like strong green teas and prefer a more gentle drink, you should try Tai Ping Hou Kui. Highly recommended! Nice long, unbroken leaves with a grassy scent, which, upon steeping, becomes a fresh, nutty, grassy aroma that hints of Japanese Matcha. A fresh sweetness, when you sip it and an oak/slightly smoky lingering aftertaste. Very nice and reminiscent of a nice Long Jing, but with more character. It´s a classic tea, I use the Xia Tou method, that essentially means to first pour a small foot or base of water, then add the tea leaves and then finally pour up the full quantity of water gently on top. The tea is very fresh. The orchid smell is amazing, and the sweet taste keeps strong even in the fourth infusion. But the tea leaves look bad. There are a lot of broken leaves and most of the leaves are not long enough. A bit of a disappointment considering the price and reputation of this tea. 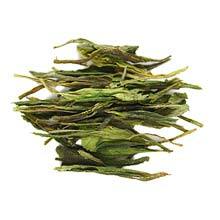 The leaves are gorgeous, flat and large, much like hand-crafted long jing, but larger and dark, rich green in color. The smell is subtle and intriguing, but the liquor taste is dull, if pleasant. Fijne, erg veel ruimte innemende blaadjes die een subtiel aftreksel prijsgeven, licht zowel in neus, kleur als afdronk. Interessante wat mysterieuze thee. Na de eerste kennismaking zeker nog niet doorgrond. Another good batch from Teaspring. Although smaller than last years leaves, it seems to be much fresher this year. A good bargain. It´s a good green tea with an interesting tobacco touch. I prefer Long Jing though. This is my first Tai Ping Hou Kui. I enjoyed the unique aroma and good flavor. Definitely a nice diversion from other greens I enjoy daily. this tea rocks!!! The smell of the dried tea leaves when i opened the bag was lovely. it smelled really fresh and really green(like barley grass). I knew i was in for a good cup of tea. What else can be said about a green tea such as this. Excellent quality, fine crafted large leaves, and excellent taste. Taste like Bi-Luo-Chun and Huang-Shan Mao Fen. Besides, its leaf shape is special. Stunning leaf, the tea should be brewed in glass to be properly appreciated. A very pleasant fresh green tea which lasted through many infusions and seemed to peak at around the 7th or 8th steep. Full of flavor and depth. In addition, the leaves are rather beautiful. I liked the Cha Wang version more, but I always enjoy Tai Ping Hou Kui. The leaf quality was high and the flavor very smooth and nice. It requires a good quantity leaves and a longer steeping time to really discover the tea: vegetal at first with a long lasting fruity/flowery aftertaste. A truly wonderful flavor that is rich and full of depth. Highly recommended. This tea seemed light and citrusy, and needed a larger amount of leaves to get a full flavor. It has less tendency to bitter and vegital than other greens and is one of the best I’ve ever had. soft and a bit sweet and has a gorgeous long green leaf. i don’t even wanna destroy it by touching it. for me this is not an everday tea - maybe it’s for quiet weekends or weekends you want to be quiet. i enjoyed it very much. A very special tea, very rich in smell and flavor. I save it for special occasions. Beautiful flat leaves and bright vegetal taste. I was able to get several infusions from the leaves. Excellent quality from batch to batch. The same beautiful leaves and lovely fragrance/taste. Big, gorgeous, dark green leaves. The brew is equally good. Very nice tea. A consistent soft tone and taste makes this tea a good choice for a quiet drink. It is obviously cultivated carefully as the leaves are in fine form in the contanier. An excellent green tea. The leaves are beautifully crafted with a criss-cross pattern and are very large and fresh. It has an excellent sweet and fruity taste and is very easy to brew. It is not as aromatic as I would expect, but still it is nonetheless one of my favorites. It was my first time trying this tea; very nice indeed. A green tea indeed superb. Spectacular the great leaves and refreshing the taste. Never have i tried Tai ping before, but i can that its not my style of tea, too fruity for my taste, tho i must admit that it was a very fresh, and the leaves were large. It is not as aromatic as I would expect from a Tao Ping Hou Kui. Not the best. With a sweet taste of flower, peach and apricot, it’s a good every day tea. Good when made in a Zhong to get all flavors and aroma. Excellent green. Slightly woody and nutty with a long sweetness. No astringent qualities like many of the whiter quality teas. It is easy to brew. I actually overbrewed my second steeping with no noticable problem. This tea looks completely unprocessed, it brews very well and was perfect on both of the two infusions, I didn’t try three but you may even get another from this. Highly recommended! Initially, the first experience with this tea is its smooth and pleasant aroma. This is followed through with a very light taste at first, until the flavor suddenly arrives. Very subtle and soothing. A nutty taste followed by a sweet after taste. I found it impossible to brew this tea incorrectly, as it remains intact and the flavor stays beautiful. It is very obvious why this tea won its award. If you are looking for a first green tea brew, this one is very easy with very high rewards. This is a great tea. Fresh, long and narrow leaves...they look totally unprocessed; just dried. The leaves are mostly triplet leaves and just really pure looking. The tea is nice and rich...hearty like a good longjing, but distinctive in a slightly quieter way, but still a full taste. No bite at all, no matter what you do to it...the leaves hold up well to 2 brewings...three if you don’t pull all of tea chi out in the first 2. This is just a classic, pure, great green tea. Enjoy! !